Object: If possible, have some containers with soil representing the types of soil in today's lesson. As Jesus traveled around the countryside with his disciples, large crowds often gathered around him to hear him teach. He often taught them by using parables. 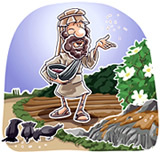 A parable is a story that Jesus made up to help people understand what he wanted to teach them. Our Bible lesson today is one of the parables of Jesus. It is called The Parable of the Sower. It was a story about a man who planted seeds in the field. Listen to the story that Jesus told. A farmer went out to sow his seed. As he scattered the seed, some fell on the hard path nearby and the birds came and ate it up. As the farmer continued to plant the seeds, some of them fell on soil that was full of rocks. There was not much dirt around the rocks so the seeds started to sprout and grow the very next day. The only problem was, there was little dirt, so the plants didn't put down roots which would help them become strong and healthy. In the afternoon, the sun was very hot so the plants that had started to grow in the rocky soil withered and died because they had no root in the ground. Some of the other seeds fell on soil that had been taken over with weeds and thorns. The weeds and thorns grew faster and taller than the plants from the seeds, so they choked out the plants that the sower wanted to grow. Finally, some seed fell on the good soil that had been plowed, fertilized, and weeded to make a good place for the seed to grow. Those seeds made healthy plants and produced good fruit. This is the lesson that Jesus wanted his disciples to learn, and it is also the lesson that he wants us to learn today. The seed that the sower was planting in the story represents the teachings of God's Word. Our heart represents the soil where the sower planted the seeds. Sometimes our Sunday School teacher or our Pastor is trying plant the teaching of God's love in our heart. If our heart is hard and filled with anger and bitterness, the teaching falls on hard ground and never grows, just like the seed that fell on the hard ground in the parable that Jesus told. There are other times when we hear the Word and we get excited about it, but then our excitement fades away because our understanding is too shallow. That's the way it was with the seed that fell on the rocky soil. Sometimes we hear the Word and we believe what it says, but we want to keep on doing the same things we have been doing. That is like planting the seed in with a bunch of weeds. I'm sure you can guess what happens. The weeds will soon take over! The last seed is the best, it fell on the good ground. If you learn from what you hear in Sunday School and church, the seed that Jesus plants in your heart will grow. Your life will produce good fruit just like Jesus intended. You will be helping others to grow in their knowledge and understanding of God's love. Our Father, help us to be like the good soil in our lesson today. Help us to listen to your Word and grow up to be the kind of boys and girls you want us to be. In Jesus' name we pray. Amen.